BrdU Cell Proliferation ELISA Kit | Cell Biolabs, Inc. The CytoSelect™ BrdU Cell Proliferation ELISA Kit detects BrdU incorporated into cellular DNA during cell proliferation using an anti-BrdU antibody. When cells are incubated in media containing BrdU, the pyrimidine analog is incorporated in place of thymidine into the newly synthesized DNA of proliferating cells. Once the labeling media is removed, the cells are fixed and the DNA is denatured in one step with a fix/denature solution (denaturation of the DNA is necessary to improve the accessibility of the incorporated BrdU for detection). Then an anti-BrdU mouse monoclonal antibody is added followed by an HRP conjugated secondary antibody to detect the incorporated BrdU. The magnitude of the absorbance for the developed color is proportional to the quantity of BrdU incorporated into cells and can be directly correlated to cell proliferation. Figure 1: Assay Principle for the CytoSelect™ BrdU Cell Proliferation ELISA Kit. 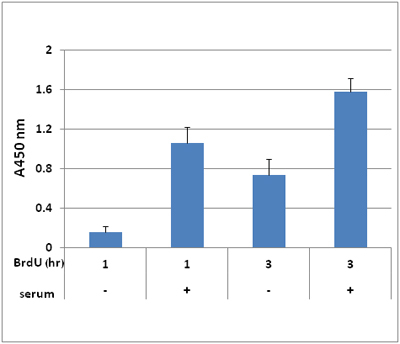 Figure 2: Serum Stimulation of Proliferation in HEK 293 Cells. Cells were plated overnight at 37ºC. Cells were then incubated in the presence or absence of 10% FBS for 24 hours, followed by treatment with 10 µM BrdU for 1 or 3 hours. Cells were tested for BrdU incorporation according to the assay protocol. Kim, B. S. et al. (2016). D-dopachrome tautomerase in adipose tissue inflammation and wound repair. J Cell Mol Med. doi:10.1111/jcmm.12936. Kreiseder, B. et al. (2015). Alpha-catulin contributes to drug-resistance of melanoma by activating NF-κB and AP-1. PLoS One. 10:e0119402-e0119402. Hatzis, C. et al. (2014) Enhancing Reproducibility in Cancer Drug Screening: How Do We Move Forward? Cancer Res. 74:4016-4023.